So after all the soups and potato bakes and cupcakes, it was time for something a little lighter (and healthier), right? Right? And since I didn't have a lot of time to prepare a meal before our weekly dance lesson (yes, TheHusband and I are taking ballroom lessons and enjoying it a lot! ), a quick salad fit the bill perfectly. The folks over at Fitsugar provided the recipe (adapted slightly by yours truly), and we provided the eager hungry tummies. It works out well, you see? 1. 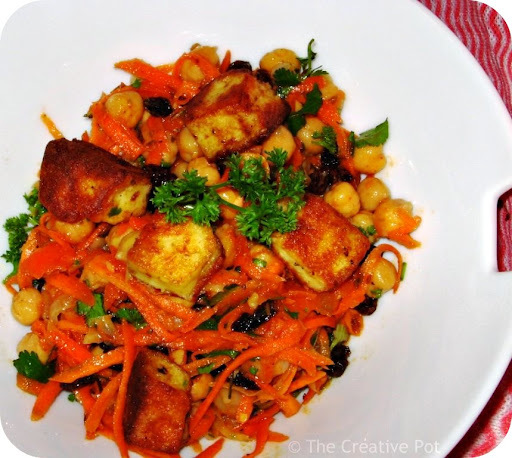 Mix chickpeas with the carrots and currants in a salad bowl. Add fresh coriander, parsley, olive oil, lemon juice, cumin seeds, coriander seeds, paprika, salt & pepper and let rest for the flavours to mingle. Preferably an hour, but we gobbled it up in 10 minutes and it still tasted good. 2. Now heat some oil in a frying pan. Coat halloumi in flour, and fry over medium heat until golden brown. 3. Serve salad scattered with fried halloumi cubes. Salad will keep in the fridge for a few days (without the halloumi). Hi again! Seems we've joined the same swap again! Fun! I have a question: what is halloumi? The recipe looks delicious! Halloumi is a white semi-hard cheese of Greek origin usually made of goats or sheep milk. It's texture is quite springy and it stands up to frying, becoming crisp on the outside and gooey on the inside. Perhaps you'll be able to find it at a deli. I forgot to add - if you can't find it, you could use feta and it would be just as delicious. This salad looks delicious. I love chickpeas. Thank you so much for visiting my blog and for your very kind comments. Juno. :-) Chickpeas are awesome aren't they? My second favourite legume (after red kidney beans). Thanks for the visits. I had a problem with my pictures, I have to re-load them, per entry. You asked about the artichokes, when they are in season you can normally find them at Fruit and Veg (the Food Lovers Market @ Willowbridge). You might find them at the Slow Food Market in Stellenbosch, but only in season (Sept - Nov). I'll have a look there. I didn't take into account the limited season, perhaps that's why I never can seem to find them... Mind you, I seem to recall having seen them once at the Fruit & Veg in Willowbridge. Thanks & welcome Mangocheeks! Always nice to meet a fellow blogger.